The trouble I had finding a place to simply put in a kayak anywhere near Saratoga Lake got me thinking. I haven't found a huge amount of information it, but ​scraps of information indicate that Kaydeross Park was at one point an amusement park containing a carousel by the lake. Now it appears to be the private recreation facilities of the adjacent townhouses. For the first time, I clicked that "Report a problem" link in Google Maps and explained the situation. I believe Kaydeross Park is mislabeled. This area appears to currently be recreational facilities for the nearby townhouses. I went there expecting it to be a park from which I could launch a kayak, but instead it had only gated access for residents. A sign facing the lake labels it as "Water's Edge." I'm having trouble finding all of the pieces of its history, but it looks like "Kaydeross Park" used to be an amusement park. In 1987 it was bought by the town, and now it is townhouses. Four days later I received a reply. Your Google Maps problem report has been reviewed, and you were right! We'll update the map soon and email you when you can see the change. That was over two weeks ago and it still hasn't changed, but that was more of a response than I honestly expected. 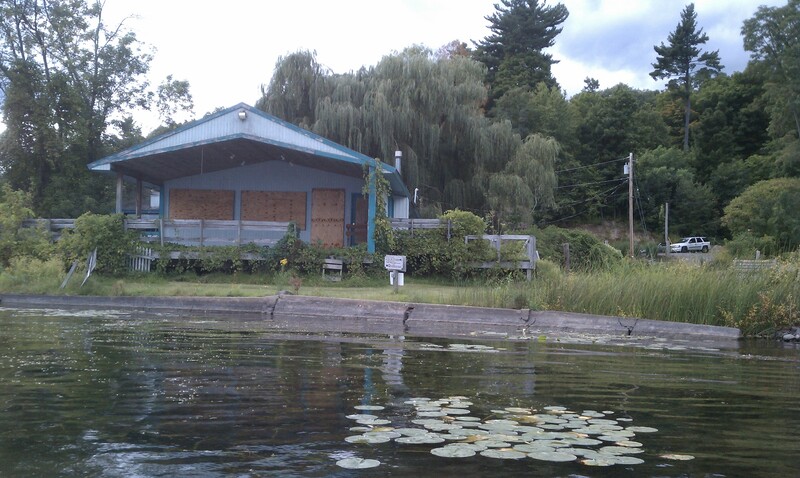 The abandoned restaurant that looked so promising yet remained gated off was my second curiosity. Off I went to ​the Saratoga County web site and asked who owned the property, what had been there previously, and why it was not being used. I was happy with his response, happy that there was at one time a plan to develop it into a waterfront park, but I interpret this extremely pessimistically. With the state boat launch at the north end of the lake, there's really no need for another park with a parking fee, and I expect residents are against welcoming visitors. Putting the two together, I used ​this which was recommended by the Deputy County Administrator to learn about what used to be Kaydeross Park. Not especially useful, but now I know I can curse The Vista on Saratoga for maintaining inviting-looking property. Back in college I set up a ​wiki to gather some information and entertaining disinformation about ​RPI. It has had its ups and downs. Spam ran out of control for some time. An unusually helpful contributor helped clean everything up and organize it for some time. It has been up for long periods of time with few changes. For almost a year, until about a week ago, it had been down since I last failed to upgrade MediaWiki to keep up with the version of PHP running on the server. But now it is back. That is all. Kayaderosseras, as I just learned from ​Wikipedia, apparently translates to "valley of the crooked stream." 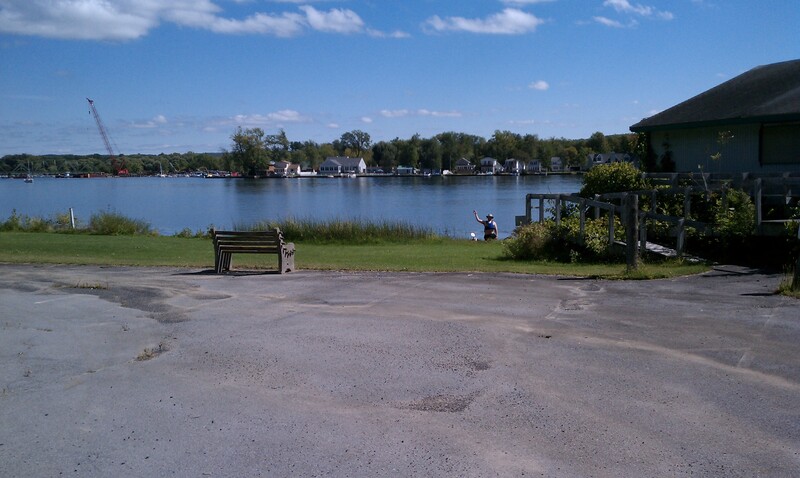 Anton and I set out to paddle up "the river to the west of Saratoga Lake." The first problem was parking. 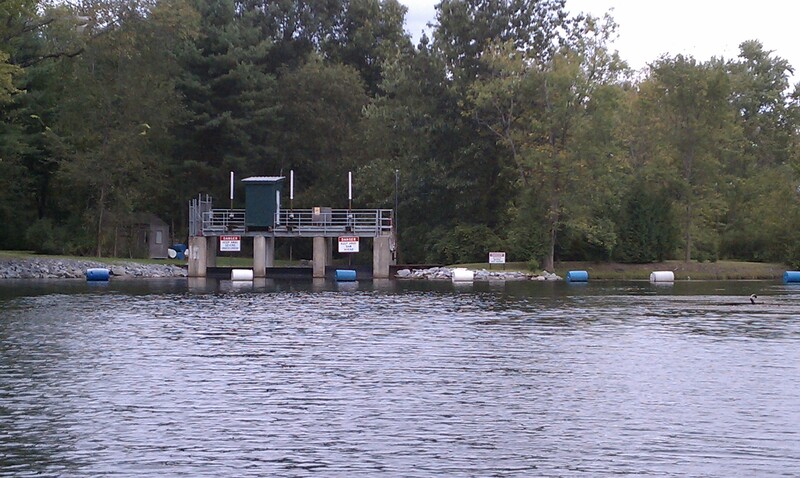 We knew we could go to the state boat launch that I've used twice at the north end of Saratoga lake, for something like eight dollars each. But I'm growing decreasingly fond of paying for access to public water. The ​Internet advised parking at the nearby gas station and walking to the state park's waterfront. That seemed shady, and there were some other better-seeming options. 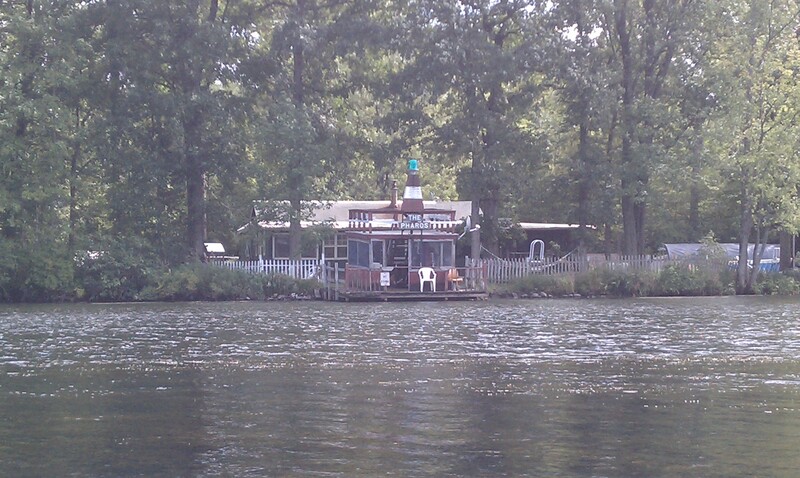 First, there was an abandoned restaurant that I've seen from the water several times. Anton and I each independently tried to drive to it, but found the road approaching it gated. I tried a few other places that looked promising on Google Maps, but I was repeatedly thwarted by private communities of jerks. When we eventually got in the water, we checked it out from that side and explored a little bit. This sign was blank facing the water. I expected it to be a "no trespassing sign," but instead it was just this. I'm technically a boat owner. 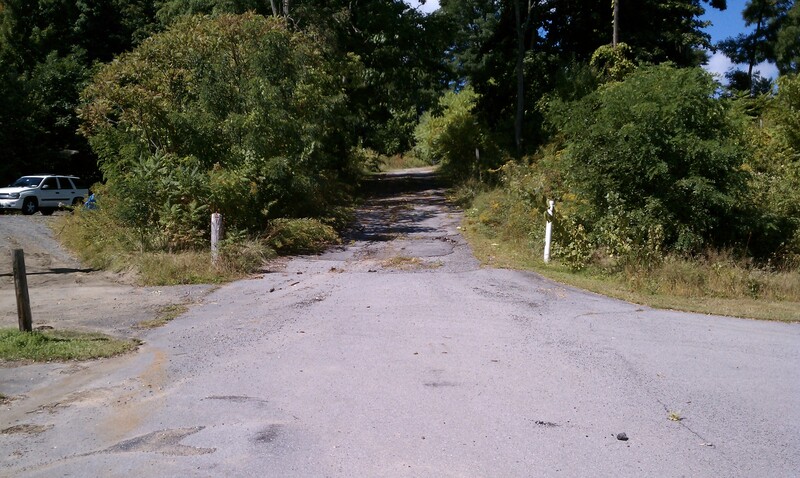 A road lead up a steep hill to the gate we had seen. 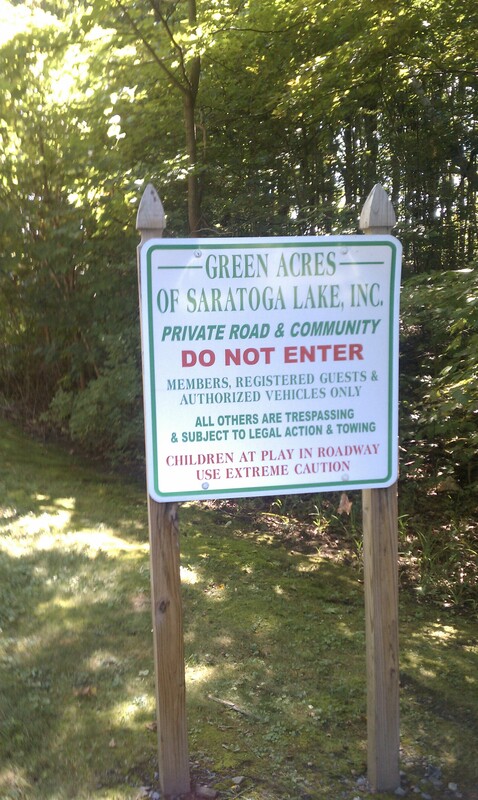 Closer inspection showed that the sign on the gate prohibited trespassing by order of Saratoga county. Anton by our boats as I started to look around. I wish I had taken some proper pictures of the restaurant. I can't find any information on what it was. The grass look better maintained than the rest of the place. 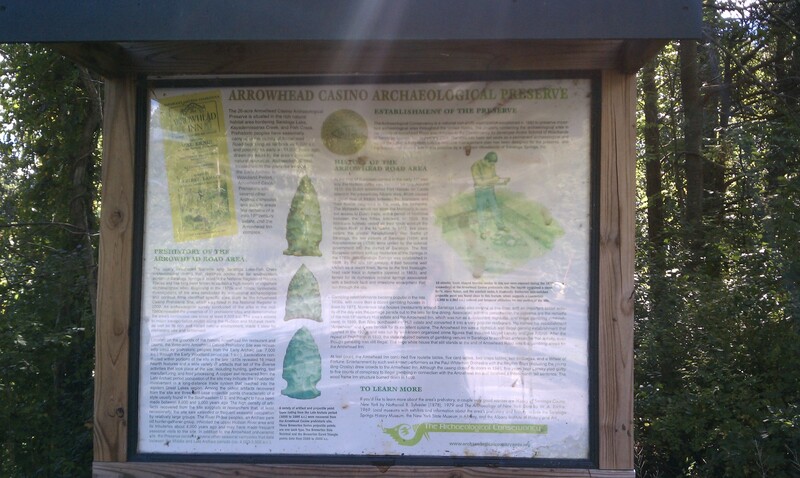 Eventually we went to what is apparently called Arrowhead Casino Archaeology Preserve, at the advise of the ​Saratoga P.L.A.N.. It took me about three minutes to walk to the end of the trail, where I found access to the water that was entirely too muddy to use. It looked as though the water had dropped a foot recently. I walked back up, and Anton eventually met me there. He wanted to see it for himself, and discovered that the path continued to the left, where we found several other small places to access the water, all of which were far less muddy. The furthest one turned out to be the most beach-like, but we didn't discover that until the way back. The whole area was rather littered. We returned to our cars, packed everything we needed into our boats, and hit the water. The weather was great, but the water was getting rather cold. Anton decided to really evaluate that situation by falling into the water as he was getting out of his canoe when we were finished. I laughed at him. There were several other highlights of the trip that I failed to photograph. Partway through the trip, I roped by kayak to Anton's canoe and briefly got a free tow. On the way back, this enabled both of us to get some ukulele time while we still made progress. This ended when we started running into other people on the water. Their bewildered stares were too much for either of us to take. Near the route 9 bridge, we ran into the first rapids I have ever hit in a kayak. Passing through them in both directions was quite uneventful, but it was a nice change of pace. 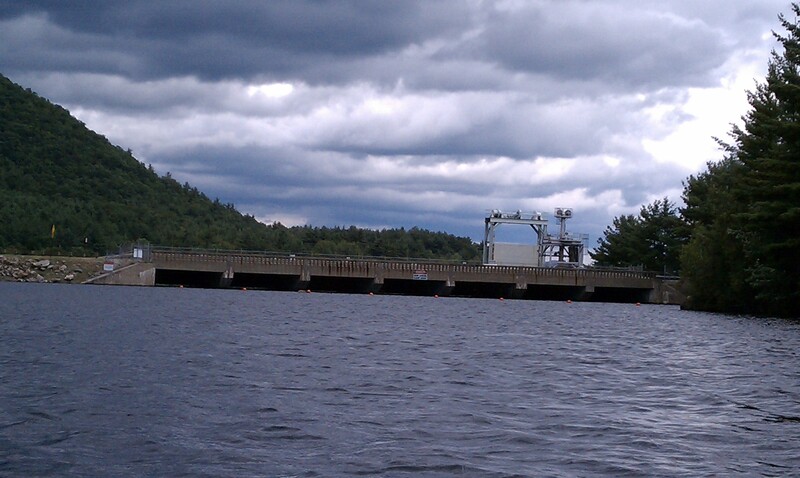 I returned to Harriman Reservoir in Vermont in order to try to hit most of the perimeter, thinking it would be almost 20 miles. Google says it was 19. It was a good trip. I'm exhausted. This is where I launched. 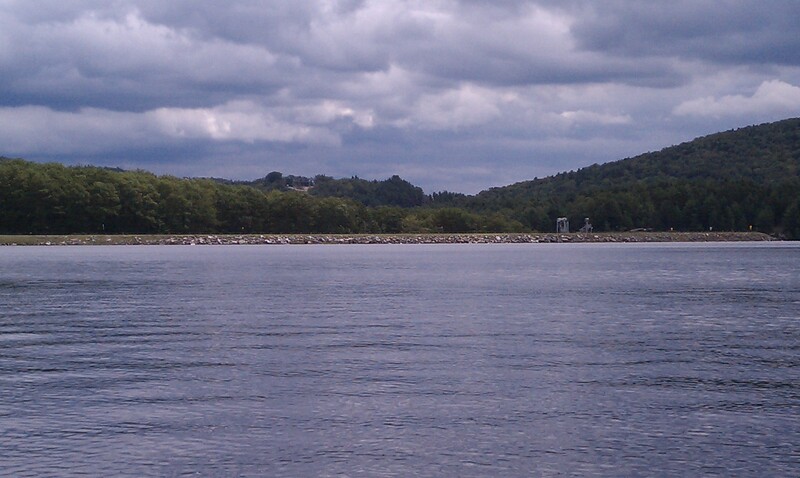 As I paddled around I discovered a handful of other boat launches. I previously thought there was just one on either end. It may have been better to use a smaller one, but since no one else was there when I arrived, it was no problem at all. The weather was amazing. I was afraid it would be too cold, but the sky remained perfectly clear all day, and the sun kept me plenty warm. Wind was minimal. There were some other people on the water, but relative to the size of the place, I may as well have had it to myself. I had gotten some fingerless "boating gloves" to try eliminate the blisters that have been getting to me on these longer trips, and I wore them this whole trip. They were a partial success, but I doubt I'll be using the pair I got again. They're already showing significant wear. The thumbs are for people with comically large thumbs and not my (apparently) petite ukulele-strumming thumbs. As a result, the thumb material kept getting bunched up and folded over, and it is just beginning to come apart. The exposed parts of my fingers, I remember now, are also parts that get irritated, and the gloves didn't help any there. I need to build some callouses. 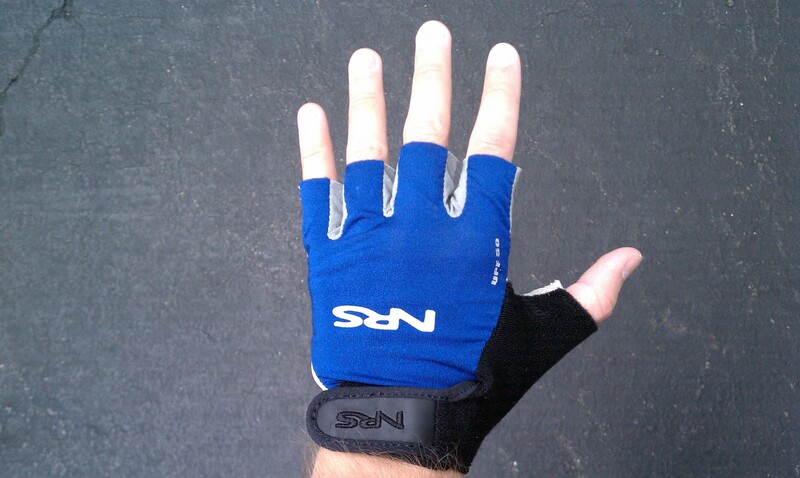 Update: Obligatory pictures of the fingerless "boating gloves." These are "after" pictures. 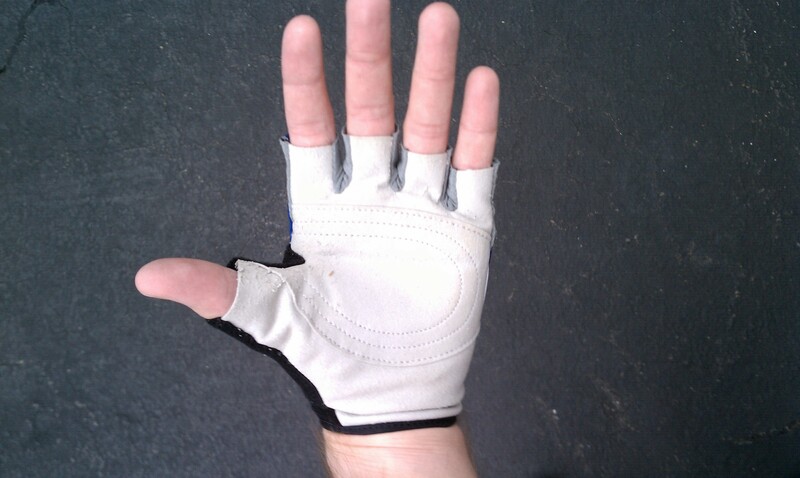 Note the wear on the fabric on the inside of the thumb. 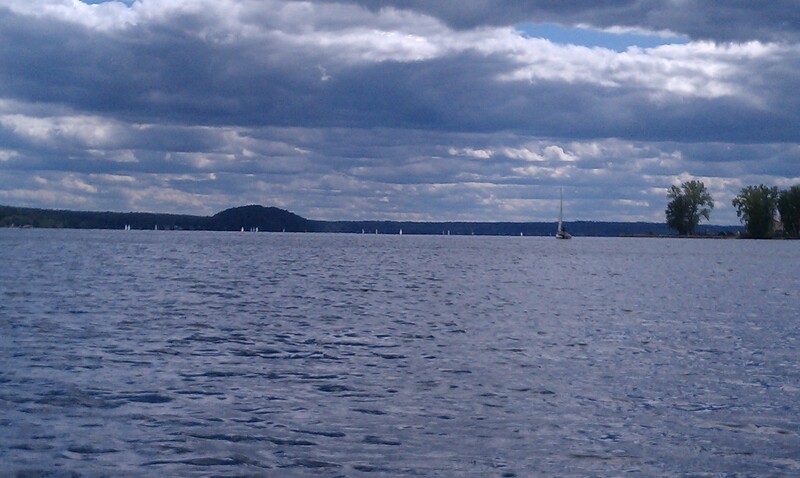 I went back to Saratoga Lake to get as much time on the water as possible. It's close. It's relatively calm. There's a stream running north from it that I hadn't explored. I paddled for almost five hours this time, and I traveled over seventeen miles. 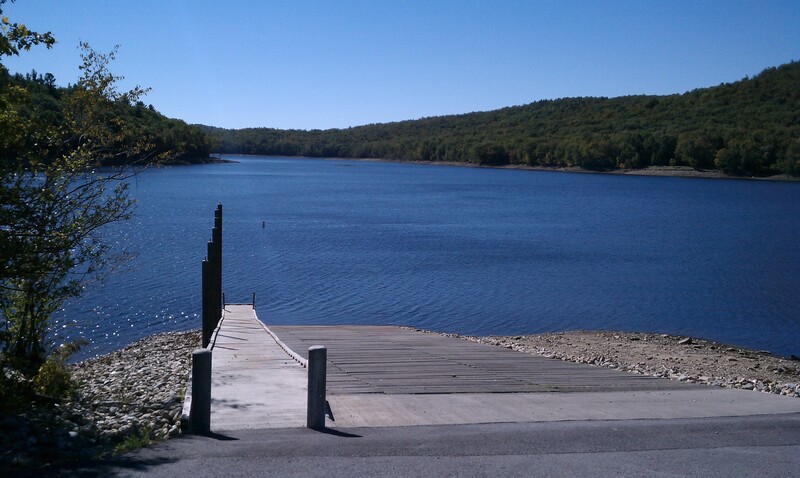 I parked at the state-run boat launch at the top of the lake for eight dollars. Heading North first, I ran into more other people on kayaks than I could count. This was reassuring, as it meant I was in the right place. Many of them seemed to be teaching others how to kayak. This was unsettling, as I've had basically no training. But that's part of the fun. I went until I hit a dam. Third one in two days. I turned around and headed back to the lake. Did I mention this was the majority of my trip? I was exhausted. Wanting to be certain that I traveled a good distance, I headed down into the lake until boats speeding around got to me and finally headed back. One puzzling place I ran across had a big sign, "The Pharos." At first I thought it was their family name and that they missed a big decorating opportunity. I didn't see any pyramids or sphinxes. It seems like a responsibility if your name is one letter off of something like that. But apparently "Pharos" refers to some light houses in some context that I don't understand. That must be why there is a lighthouse on the sign. Another interesting place was a beat up old building on the remains of what was once a bridge. I thought it was abandoned, but someone posed for me on it. This place apparently would have let me launch for five dollars. On my way back a handful of people were launching canoes and kayaks from a rather steep embankment just on the other side of the bridge. It was apparently a good day to sail. A former restaurant. 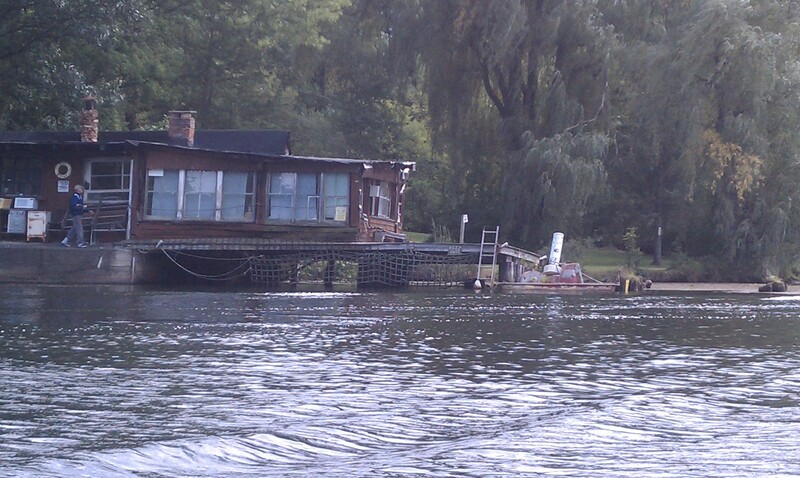 I wonder if I could put my boat in there and park in their parking lot. I bet the other side of that sign says, "no trespassing." This is where I thought I was going to launch. According to Google Maps, it's Kaydeross Park, but I believe it is now recreational facilities owned by the housing development nearby. 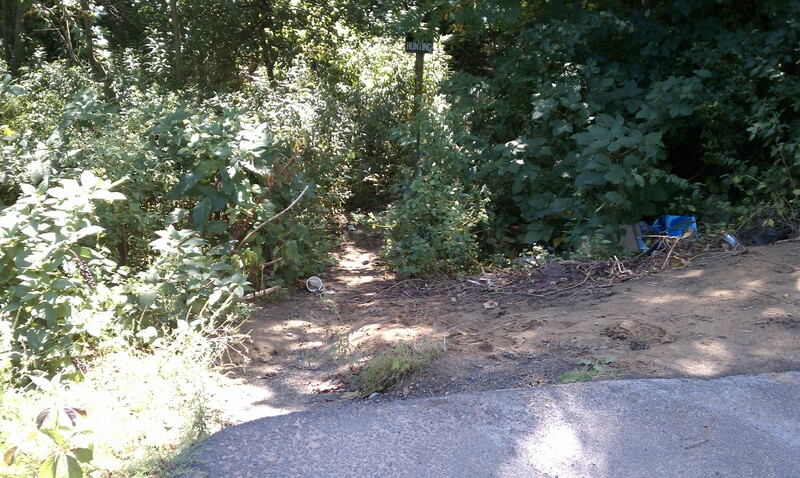 I drove up to it, but it had signs and a gate preventing my exploration. My speed this trip was lower than I'd like. I think I was mainly still tired from yesterday. It was pretty windy but it wasn't terrible to paddle against it. I think what really stopped me was that it was starting to get colder, I needed some real food, and my hands were getting pretty blistered. I wrote a script to calculate the total distance and time from every .csv file in http://www.unprompted.com/share/kayak/. The data from those files includes all of my time on the water plus sometimes part of me walking from my car to the water as I'm preparing to launch and packing up. I know people who like to compare the entertainment value of things to seeing a movie in a theater, where a movie costs over $10 for about two hours of entertainment. Without giving exact numbers, I'm nowhere near that efficient (and that's not even very efficient), but I am way closer than I expected to be, even only a partial summer into this. I like to measure how far I walk/run/bike/drive/kayak in terms of travelling to the moon. The moon, on average, is about 238,857 miles away. If I kayaked toward the moon, the same amount each summer as I've done this summer, it would take me 2409 summers to arrive at the moon. I got it in my head that I wanted a map with all of the places I've gone kayaking. I wanted not just a Google Maps map but a physical map on my wall where I could mark off places and see the big picture in person. I got a cork board and the biggest state map I could easily find. Upon closer inspection, the map I got was not at all what I wanted, and I couldn't find any better. I know the USGS makes lots of map data available, but after playing with their web site for some time, I just couldn't figure out how to get what I wanted, and they kept wanting me to put things in shopping carts to download them. Bleh. I ended up using Google Maps. I remember reading that Google gets their topographical data from USGS anyway, so I didn't feel bad about stealing it. Here's how it went. I went to Google Maps, zoomed into the rough area I was interested in at the zoom level I thought I wanted, and opened resource tracking in Google Chrome to get the URL for one of the map tiles. The parameters in it were obvious enough. I fetched a block of tiles, being sure to cache them on disk so I wasn't hammering Google every time I reran my script. With my starting tile set, it was a quick matter of trial and error to get the exact area I wanted. It didn't take much code with ​PIL to combine the tiles into one big JPEG. Next I needed to print the big image on a bunch of sheets of paper as big as I could for my cork board. I used ​PosteRazor to accomplish this without much hassle, though there are a handful of other similar tools available. I did some arts and crafts, cutting out the prints and taping them together. Then I started throwing in some pins, using big red pins to mark my launch points and small black pins to mark roughly the maximum distances I went from the launch points. Not too shabby. Needs more pins in it! Today was odd. 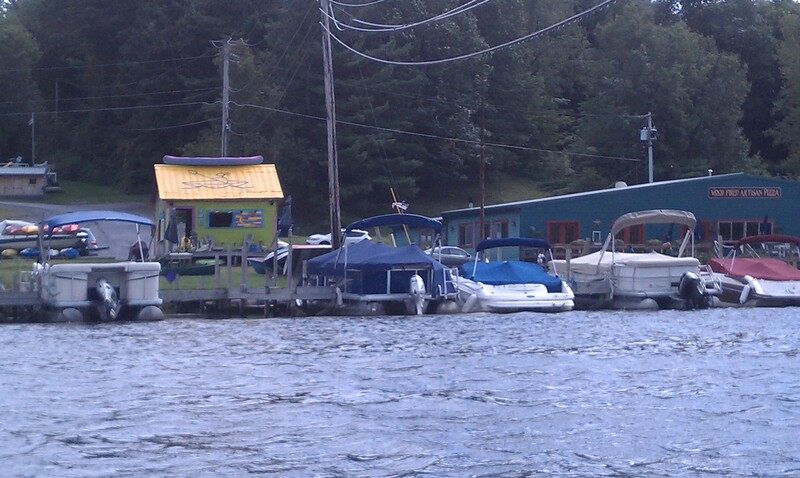 I intended to make a long exhausting trip on Great Sacandaga Lake. On my way to my planned launch spot, I saw a sign for public boat access. That sounded better than the state park I was going to launch from, as it would have likely charged me around $8 and "public" means "free." I immediately and accidentally passed it, turned around, went back, and pulled in. 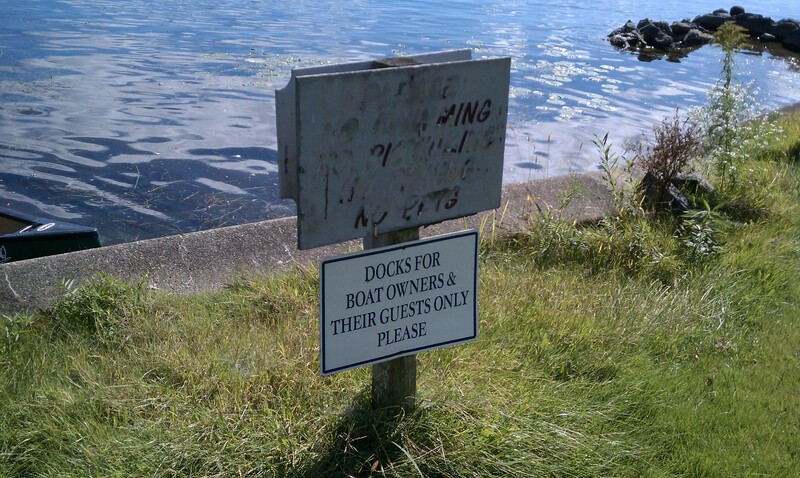 I passed the boat launch area to which the sign was referring. It was occupied by people backing in their motor boats, but there were a bunch of other paths that appeared to go to the water, so I kept driving. 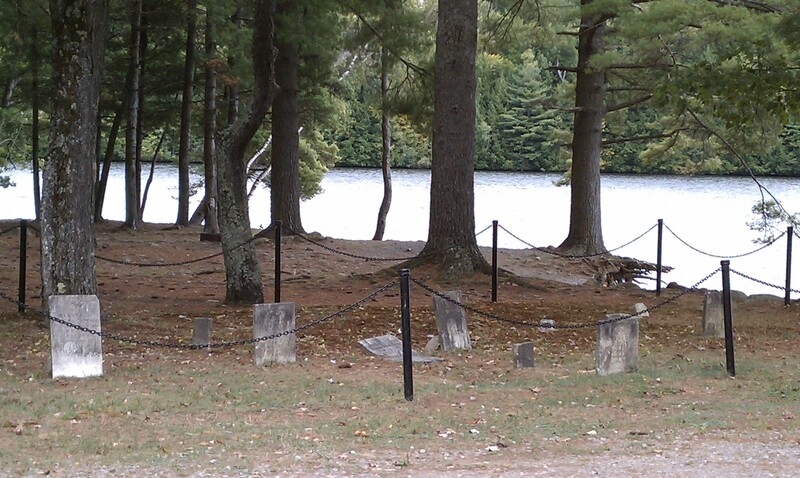 There were a handful of camp areas (though no overnight camping was allowed) around the water. It was actually pretty busy. There was a tiny graveyard here. Eerie. 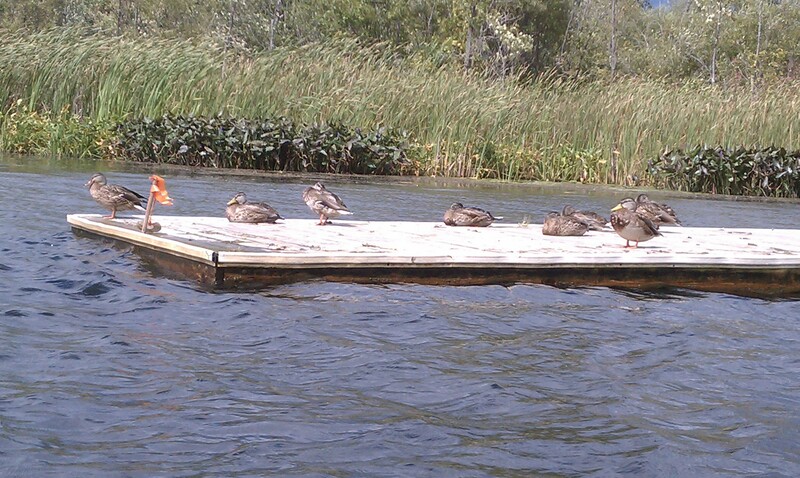 I found what looked like an open parking area close enough to the water for me to launch, and I was off. It was windier than I would have liked. 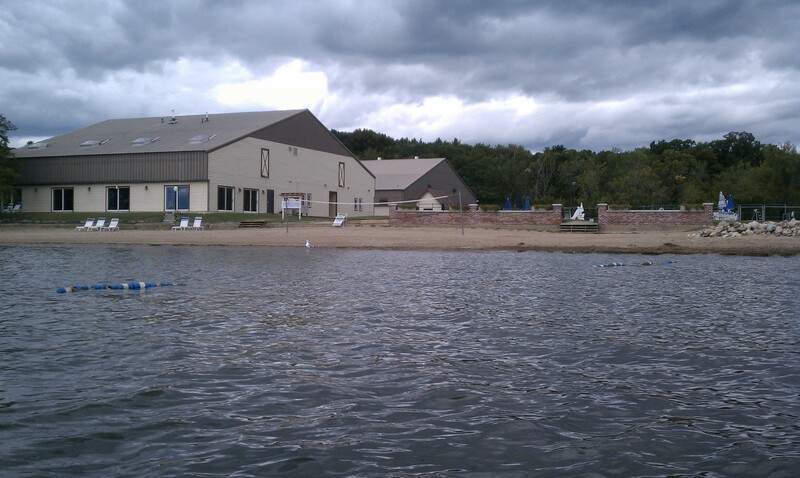 The water was a bit choppy, but not nearly as rough as my first time at the proper Great Sacandaga Lake. I headed west, into the wind, and before I knew it, I hit a dam. So I turned around, passed my starting point and then a bunch of camp areas. I passed some people setting off fireworks from a boat. Then I hit the real dam. 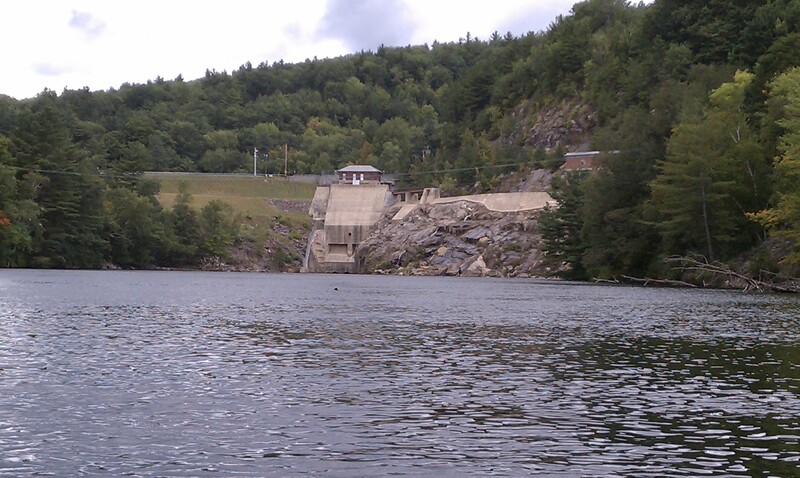 I explored a bit, minding to stay a safe distance from the business end of the dam. About then, the wind really picked up, it started drizzling, and I think I saw some flashes way off in the distance. I raced back, hugging the shore in case the sky really opened up and I needed to quickly find shelter on land. I got back to where I started and decided to just call it a day, hours before I planned. I wasn't sure if the weather was going to hold out, it only seemed to be getting windier, and I had already explored most of the area. On my way out I saw a bunch of other kayakers on the other side of the dam, in some rather rough water. I kept driving.